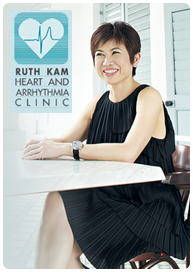 Dr Ruth Kam obtained her basic medical degree from the National University of Singapore in 1986. She was awarded the President’s Scholarship for her medical studies from 1981 to 1985. She did her training in Internal Medicine and obtained her MRCP in UK in 1990 and Master in Internal Medicine from the National University of Singapore in 1991. She then obtained her specialist training in Cardiology at the Singapore General Hospital from 1991 to 1994, after which she proceeded on a scholarship to Massachusetts General Hospital, Boston, USA where she was further trained in Cardiac Electrophysiology and Catheter Ablation from 1994-1995; and then in Cardiac Pacemaker and Defibrillator Implantation from 1995 -1996. She was also a research fellow in Medicine at Harvard University from 1994-1995. She is now in private practice in Mount Elizabeth Hospital offering general cardiology services, as well as specialized services in cardiac arrhythmias: including Holter monitoring; tilt table testing; electrophysiological studies and catheter ablation; loop recorder, permanent pacemaker and implantable defibrillator implantation and follow-up; and percutaneous extraction of pacemaker and defibrillator leads. She has also been very interested in cardiology problems in women, having done some research on the pattern of ischemic heart disease in women in Singapore. She lectures on a variety of subjects ranging from general cardiology to arrhythmia and pacemaker technology to general practitioners, specialists, university and polytechnic students as well as lay people. She is a visiting doctor to many public hospitals in Singapore, including National Heart Centre, National University Hospital, Changi General Hospital, Kadang Kerbau Women and Children’s Hospital and Tan Tock Seng Hospital as well as Gleneagles Hospital at Jerudong Park Medical Centre in Brunei. She has also been invited to demonstrate and teach at several overseas centres such as Myanmar, Thailand, Vietnam and Brunei. She contributes regularly to articles on heart conditions for lay people in local newspapers and newsletters.